These days, Computers are being used in hospitals extensively. We can computerize the accounting, payroll and stock system of the hospital. We can keep the record of different medicines. Computer can be used to store the medical history of the patients. Medical history is very important for patients as well as doctors. Doctors may better prescribe the medicines on the basis of the medicines used in past for a particular patient and the results obtained. Database Management System software is used to store Patient records efficiently. Patient records and history are stored on computer databases in the medical field. The medical history of a patient includes physical symptoms, diagnoses, treatments, and even family medical history. Details of the medications prescribed are stored together with details of any that can not be prescribed, such as an allergy to penicillin. Appointments are scheduled using a computer database. Billing information is also stored. Hospitals and surgeries depend on computers for administrative and financial functions. Many computerized devices are used to monitor the blood pressure, heartbeat and brain of the patients. Computers guide in some surgical operations, too. For example in laparoscopic surgery, the surgeon inserts the medical tools and a small camera, and conducts the operation with the help of computers and monitors. Computers also monitor heart rates, pulse rates and brain readings. Therefore, we conclude that computers make this possible to deal with such complicated operations. It would be virtually impossible for a human to do this. Computers are being used to diagnose diseases with the help of software. There are some Medical Software to diagnose diseases and prescribe medicine on the basis of symptoms. 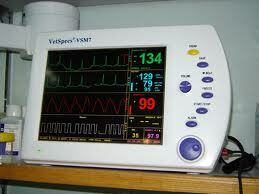 Life support systems are used to help disabled persons, for example hearing aid device for deaf people. Latest life support devices use computer technology to help the disable people, to overcome their disabilities. Doctors and other staff can use internet to communicate to doctors in other parts of the world, for sharing information on medical topics or even about a particular patient case. They can exchange pictures, reports and other documents, too. 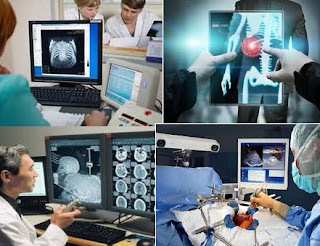 Computers are being used in Medical Radiology / Diagnostic Imaging. Computers play an role in all types of clinical image processing like CT scan and ultrasound. Ultrasound uses sound waves that bounce off body parts, producing echoes. A computer translates the echoes into images, showing broken bones, muscle problems, or changes in organs, accurately.